Ndola residents have taken to the streets demanding the announcement of presidential results. 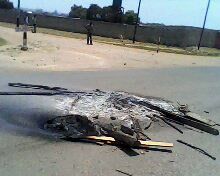 Some shops owned by Somalians were gutted by riotious youths near ndeke township. Goods worth millions of kwacha have been destroyed as shop owners went into hiding. “They are on the streets with stones and we can only urge them to stop the riotous behavior,” Copper Belt police chief Martin Malama said.